Hurray! It’s twins or more, what a great occasion to celebrate! Hurry to wish the parents of two new babies the very best wishes! How can you do it in the best possible way? 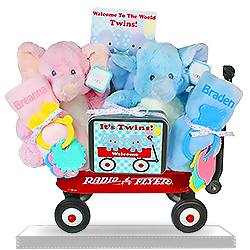 Choose something from our wide assortment of gift baskets for twins or more: a boy or a girl, two boys or two girls, or more babies - we have it all! These cute gift baskets are designed for families with many babies, with necessary things for the babies, as well as their parents. They will no doubt appreciate your attention, as well as the things they’ll find inside: bibs and blankets, diapers, clothing, fork and spoon sets, and so much more to ease their life at first. 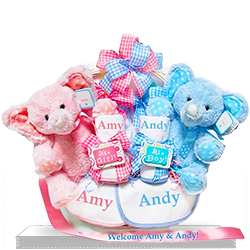 Some of these gift baskets can be personalized, so make sure you put the babies’ names on the ribbons or blankets, and make this a memorable gift basket.